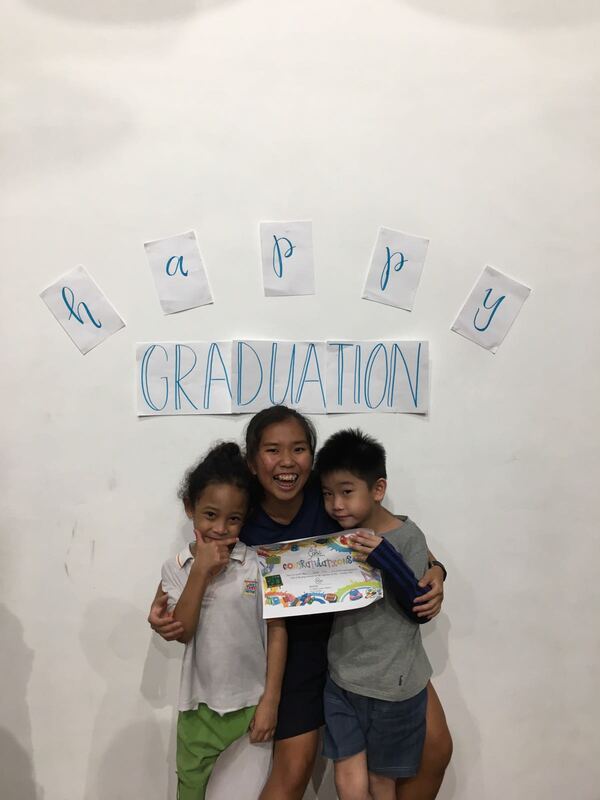 Sessions flew past this semester, and we had our graduation last Friday and Saturday, where we bid bittersweet goodbyes to these children. Every last session, the volunteers come together to reminisce and debrief about the 12 sessions. As we reflect on the semester, let us take a look at what Yi Lin, a senior volunteer, have to say! "Gift is a place I hold close to heart and I’m glad to spend more time here this year. Due to heavy school commitments, I found it hard to be down for session often. But I figured, with some help, that when there’s a will there’s a way. Each time a child walks in, all smiles and excited to begin, it spurs me to give them my best. 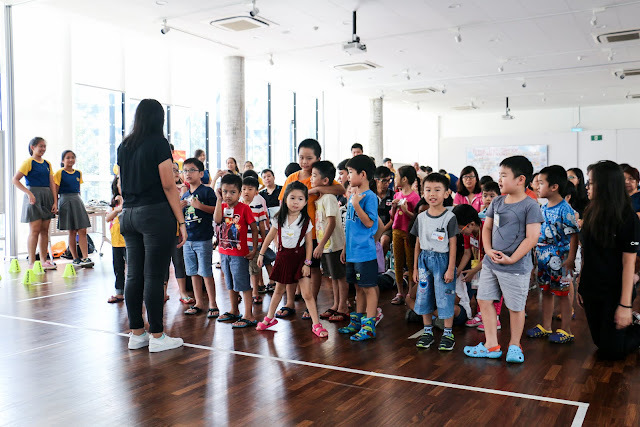 It feels as though there is magic working on us, no matter how tired each volunteer is, we just seem to pick ourselves up and conduct our songs and games, activities and reading. I would like to believe that this magical phenomenon is possible because of love. Love between the children and volunteers. I’m glad I found my way back home, to be back at Gift. The semester was generally hectic and everyone was really busy. Apart from having the floor ball boys from EJC, we also received our newest additions from JSS. Taking up the role of a senior volunteer this time round to guide them along and to show them the way was daunting. It has never occurred to me that someday I have to be responsible in this manner. Albeit deterring, the encouragement and support from other volunteers impelled me to just do it and to do it well. It is encouraging to see more people wanting to give their time and spread the love. I hope that in time to come, they too will find their purpose in gift and be propelled by their passion, to do even more for the children just as I did. This semester our activities were planned along the lines of fables – short stories that convey morals. Some fables we did were the three little pigs, crow and the pitcher and the lion and the mouse. My personal favorite was the lion and the mouse where we made lion puppets with a wooden spoon. I recall vividly adding features to the spoon. The children and I added sharp teeth, huge round eyes and a tiny nose etc for our lions. It is always amazing to see how the children explore the various options and how creative they can be. The children teach me so much about doing what you like and what makes you happy. In session, not only do the children benefit, I think the volunteers learn equally much if not more. 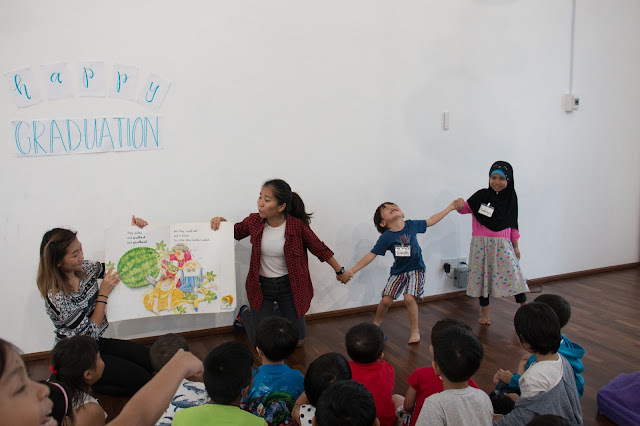 I am glad the semester ended off on a high note with our favourite story – The enormous watermelon! The story is probably familiar to our children yet they follow through with such enthusiasm and energy. Their innocence and happiness have brushed off me and as we sang our goodbye song, it tugged at my heartstrings that the next time we’ll meet would be next year. I truly look forward to another fruitful year with everyone. And, “With a great big hug and a kiss from me to you, wont you say you love me too…” I am once again convinced that not all gifts come in boxes and packages. Thank you children and volunteers for the gift of love, warmth and laughter, here at Gift of Reading." With that, we want to extend our love and deepest gratitude to the parents, who have been supporting us continuously throughout all these years. Thank you for trusting your children with us, and showering us with your constant encouragements. Also, to the parents who have given us feedbacks, we've heard you and we hope to back next year, better and bigger!